The Billy Goat Outback Brush Cutter is designed and thoroughly tested to withstand an unexpected encounter with almost anything without breaking the blade or throwing a belt. 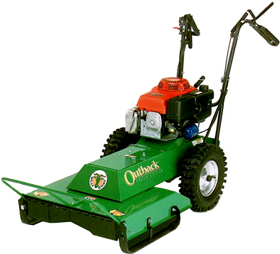 The Billy Goat Outback Brush Cutter cuts a clear path through the densest brush, grass and weeds over 8 feet tall, saplings up to 1.5 inches in diameter, and other problem vegetation at the rate of 2/3 acre per hour. 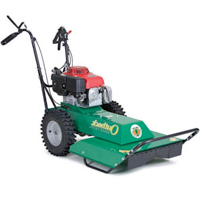 If the front brush card can push it over, the Outback Brush Cutter will cut. Spindle Assembly: Buttressed in four directions to withstand the unexpected. Weight: BC2402H – 278 lbs.